The Program is named after its benefactor, James Joo-Jin Kim. 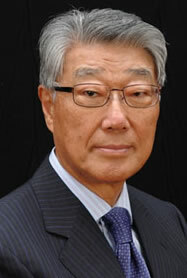 James Joo-Jin Kim (W'59, G'61, GR'63) is the Executive Chairman of Amkor Technology, Inc., one of the world's largest independent providers of semiconductor packaging and test services. He founded Amkor in 1968, incorporating in 1970 and before founding Amkor, Mr. Kim taught at Villanova University. In 1990, Kim was awarded the honorary degree of Doctor of Commercial Science by Villanova University. He also received an honorary Ph.D. in Economics from Chunnam National University, Kwang Ju, Korea, in 1996. Additionally, he received the Korean Presidential Commendation for his contributions to advancing the nation's electronics industries in 1979. Most recently, Kim received the Semiconductor Industry Award as a Pioneer in the Merchant Packaging Industry in 1998. At Penn, Kim has been an advocate and supporter of Korean Studies for a quarter of a century, as well as an active philanthropist in Korea and the United States. He is a former member of the Board of Overseers of the School of Arts and Sciences and Wharton's Executive Board for Asia, and a former member of the Penn Alumni Council and Penn Alumni Board of Directors. He is a former Penn Trustee and currently serves as a Trustee Emeritus, he endowed the James Joo-Jin Kim Professorship at the Wharton School, and he is a significant contributor to Huntsman Hall. Mr. Kim established the James J. Kim Trustee Scholarship and the James Joo-Jin Kim Professorship in Economics in the School of Arts and Sciences at Penn.